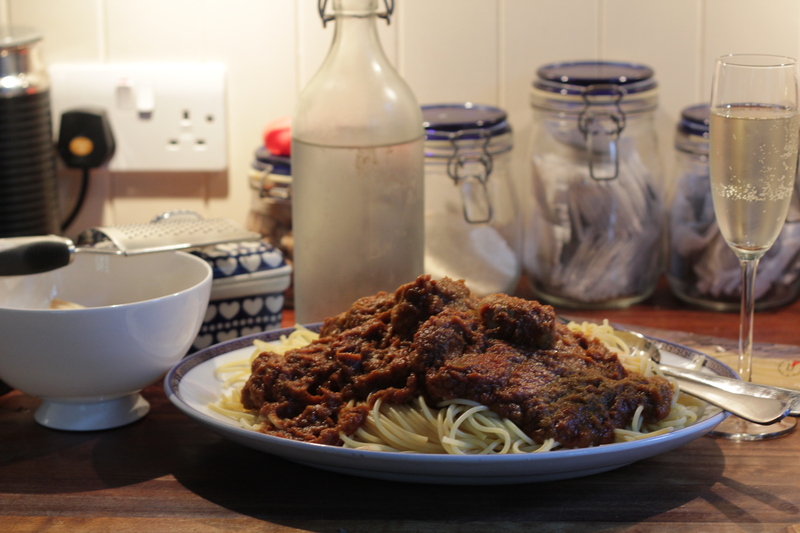 The worlds easiest meatball recipe …. take one pack of good quality sausages, I like Waitrose own, Sainsbury’s Taste The Difference or Tesco Finest with a minimum 80% meat content …. skin the sausages and cut in half, roll into ball shapes and dust in a little seasoned flour. Lightly brown in oil, I prefer Rapeseed oil, gives a nice colour and heats more quickly and to a higher temperature than olive oil. Once brown, remove from heat, drain away excess oil. Pour on a homemade tomato sauce (onions, garlic, tomatoes, basil, salt, pepper and a small tsp of sugar) and simmer gently with a stick of celery in the tomato sauce until the sausagemeat is cooked through. My grandfather was Italian and there is something authentically Italian about the smell of tomatoes, celery, onions and garlic combined and simmering away – if you forget the celery it never smells or tastes quite the same to me, but you can use celery salt as an alternative.